The Localisation Manager can be accessed from the ENGAGE -> LOCALIZATION navigation manager. It is used to localise the text in Push Notifications and Engage in game actions that contain text, like Simple Messages, Game Parameters. Image Messages can also be localized, but the translations for them are mangaed from within the Image Message action tool. Import text and localizations from an existing .PO file with the “Insert from FILE” button. You can also filter the text list to make it easier to locate something by typing into the ID filter or the Text filter areas. 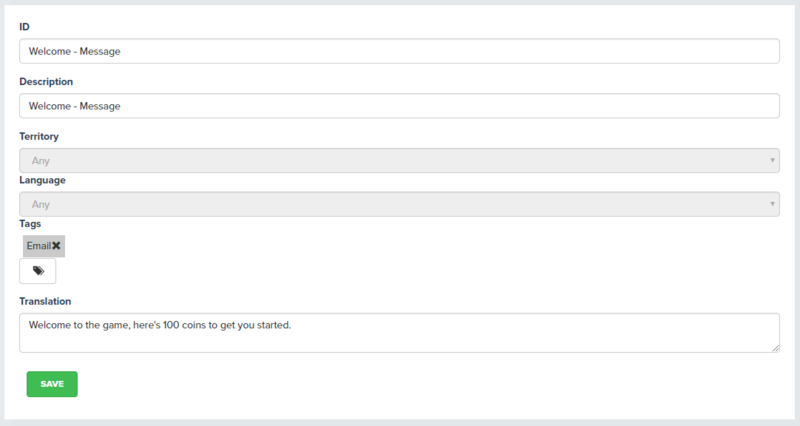 You can also TAG your text entries, then filter the list by TAG to make it easier to find things. When you edit the default un-localized message you can change the ID, the Description and the Text as well as assign or remove multiple TAGs. When you click the “Translate” button on any localisation you will be taken to the Translation Manager where you can Add / Edit and Delete localised text for the territories & languages you require. Select the Territory and Language and add the localised text and add your translation. Please Note. Unity will does not provide the territory element of a locale when making engage requests. You should therefore make sure you configure any localizations destined for Unity builds with the Territory set to “Any” as in the example above.